"Your target cadence is 160 steps per minute, and you're currently running at 155. Swing your arms faster to increase your step rate," said my running coach, in a training session devised to help me run efficiently, in my quest for a new PB this year. However, this wasn't your average personal trainer. Rather than an expensive PT on an extortionate hourly rate, my coach is Moov - an $85 fitness tracker that started life as a crowdfunding project last year. Rather than being a run tracker, such as the Garmin Vivoactive, Polar V800 or other GPS running watches, Moov is a trainer, and the aim of the game is to turn you into a better runner, with actionable information and personalised coaching. And since its launch, Moov now has a cycling app – as well as options for swimming and cardio boxing. They all use the same tracker, so there's no need for extra purchases, and makes the crowdfunded coach one of the most complete fitness wearables available. But does it work? And can Moov really complete with the plethora of fitness wearables on the market? We hit the roads to find out. 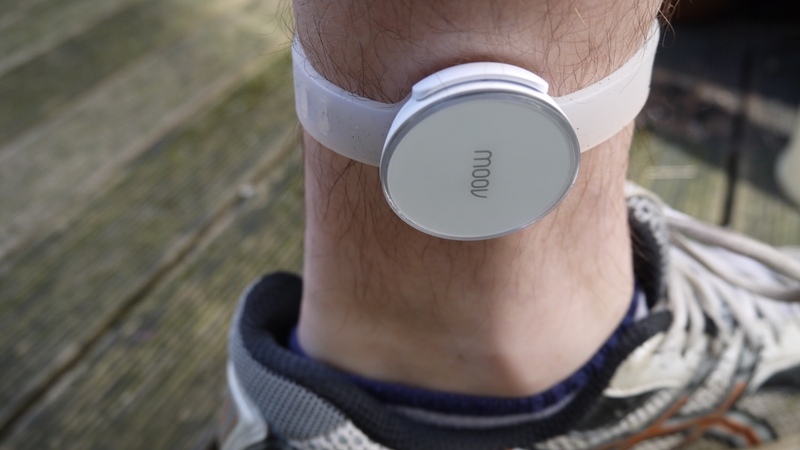 Moov is a small, round element, which you clip into a strap and wear around your leg. It's made of white plastic, and at first can feel a little cheap. To mount it onto the strap you have to line up the grooves and press hard until they snap together. The first time we took Moov out, we didn't have it mounted correctly, and was lucky to find it after it dropped out. The strap is equally awkward. One of those where you must push the pins through the holes with brute force, even when it's on, the plastic feels rough and picks up dirt easily. However, beyond this design negativity, Moov has a brilliant set of features. You download the app onto your smartphone, pair the device – which is one of the easiest devices we've ever set up – and you're ready to run. Moov is designed to be strapped to your ankle, where it uses an accelerometer to measure a host of data about your running style. For swimming and boxing it goes on your arm. It will keep tabs on your steps per minute (cadence), length and angle of your stride and the force the impact with the ground, and will constantly monitor your progress during training sessions. All of these criteria can help you run faster and more efficiently, helping you go longer and further and reducing injury risk at the same time. You can have Moov coach you in sprint sessions (designed to burn calories), speed endurance (to help you build distance and speed), running efficiency (run further and better) and an open training session. The only downside, and it is a significant one, is that you need to take your phone out to run with you. Moov also cleverly borrows your phone's GPS so it generates accurate stats, and the voice coaching is delivered via the app, which means you need to plug your headphones in for the session. Whether running with your phone is a burden or not is highly subjective. Many people use their phones for music anyway, and whether that's a dealbreaker is personal preference. When you choose the mode you want to train in, you start the session and Moov sends you out for a warm up. Unlike most run trackers, it's best not to start app as soon as you leave the house, as once your five minute countdown starts, the session is underway. It's best to get to your local park, limber up and then start your training. Before you start your training, the app will ask you some questions and then suggest a level for your training session. There are 46 difficulty levels, so not only is there a huge degree of abilities, you can really fine tune the training to suit you. Every training session is built into intervals, and then Moov guides you to hitting your targets. If you're supposed to be running an 8 minute mile, or run a more efficient cadence Moov will bark at you to speed up, or slow down, and provide tips when you need them. It even told us that we were running too fast in our warm up. "Keep going", "look ahead", "straighten your back", "swing your arms faster", "shorten your stride" are all in its armoury, as well as "keep going, you can do it" if you start to walk, and a frustrating "is everything okay?" when the bodiless voice finally crushes your spirit. You scream out "no!" before remembering that Moov can't hear you. The first time you embark on a training session, Moov asks you some questions, and this specific session, it asked: "how easily could you run a 10 minute mile?" "Piece of cake", we replied, and Moov prescribed that we ran 3x mile long intervals at 7.05 min/mile – an insane pace. We were broken, halfway through the first mile, as Moov relentlessly barked out how many metres behind the pace we were, a number that grew as quickly as hope faded. Afterwards Moov suggested we tried a much easier level – and we almost sensed apology in its robotic voice. The thing about Moov's training is that unlike any tracker we've tried before. It actively structures your training, offering advice that you can take into any run. What's more, you can reduce the amount of vocal coaching, so you can take it out for a quiet weekend run and still have all the data collected, without being shouted at every two seconds. But the best thing is that the advice it offers stays with you, and affects your running. Since using Moov, our times have fallen – by nearly a minute per mile, and genuinely because of tips we've picked up in our session. We're running more productive intervals and with better form – and it's one of the finest examples of wearable tech helping achieve new goals. The bright yellow Moov app won't be winning any design awards, but it's clean and easy to use and works with iOS and Android. The pairing is really easy, and we've never suffered any problems syncing Moov with our handset. The data that Moov produced on your runs is also one of the most immersive out there, short of perhaps the Garmin Fenix 3 – but in some ways the Moov is more useful. Everything it tracks is an actionable part of your run, from the pace to you cadence, impact g-force and the range of motion in your legs, which is displayed alongside pace, time and distance. You can review graphs and charts of all your runs, and the app explains each metric, with a small explanation of whether you should be aiming at high and low scores. Moov mixes a fantastic amount of running data in a user-friendly way, which explains complex metrics in an easy to understand way. While not even 10% as powerful as Garmin Connect as an ecosystem, Moov actually deciphers the data, and most runners could benefit from the training it provides. Given Moov's versatile tech, the company has since released an update to include cycling training. From the same position on the leg, Moov can coach cyclists on the correct cadence, helping keep training sessions at an optimum pace. It will also keep tabs on your rides, giving you data on the intensity of your workouts, by tracking power, cadence, elevation, speed and the difficulty of your route. While it's one of the best cycling trackers on the market, we can't help but feel it's fallen short. While the beauty of the run tracking is that it coaches you to be a better runner, the cycling features are more passive, giving you an evaluation. The difficulty and dangers of cycling with headphones mean that coaching isn't as easy, and of course, unless you have your own velodrome, it's difficult to optimise workouts while out on the road. The disappointing thing is that Moov only works while out on the road. We took it into the gym hoping to track our spinning sessions, yet without a GPS signal the workout wasn't recorded. This seems like a huge oversight, as while the ability to track road cycles is interesting – there's little you can do to affect your cycling performance. The gym feels like a natural fit for Moov, which could act as your own spinning instructor. Moov is a brilliant run trainer that's unique within the sports wearables. More than just a tracker, the coaching on offer is superb, and most runners can learn genuinely useful information and use the device to train more efficiently. The only downside is the need to take your phone along for a run, and for many people, that will be a dealbreaker. However, the fantastic stats and coaching insights make it worth the inconvenience for genuinely knocking minutes off your PB.